Any minimum 2 Stamp purchase will receive a FREE mini stamp . Both stamp & pattern will be revealed during the hop Also there will be a sale 20% off your ENTIRE purchase using code:. JULY starting on Friday The free mini stamp & sale will end Aug.1, 2014. 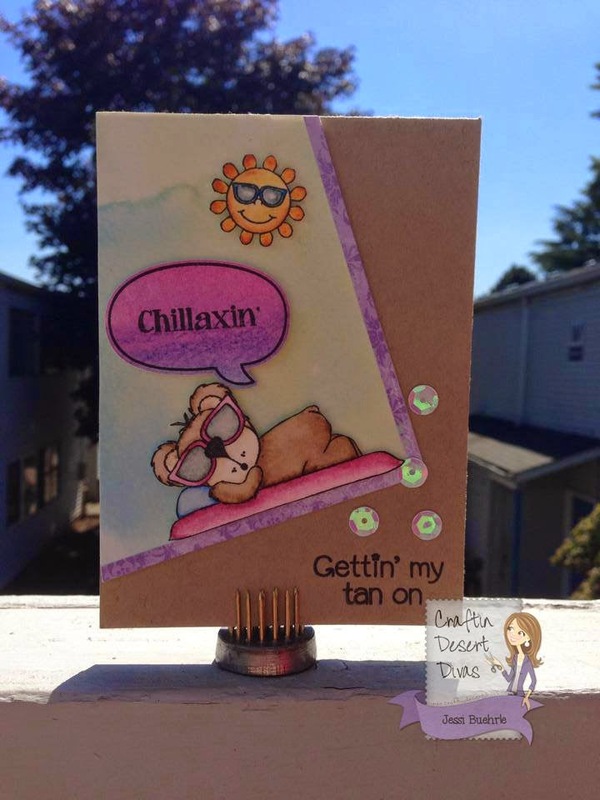 Welcome to Day 1 of Craftin Desert Divas July stamp release! Each day we will be giving you a sneak peek at one of the five new stamp sets. Then, on Friday and Saturday, we will have a blog hop with prizes each day. There are some amazing creations being shared today during this stamp release. We Also have some special guest designers who will be joining us. Today I have created a mini notecard. I do not normally color images, so this is a little bit out of my comfort zone. 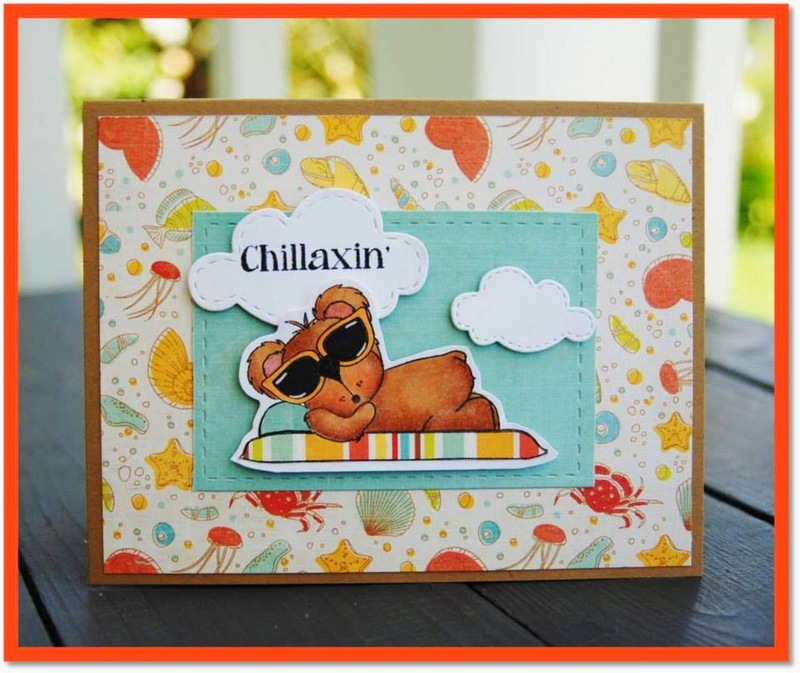 For today's project I did use the SVG cut and cut out the bear and then I stamped on the image. 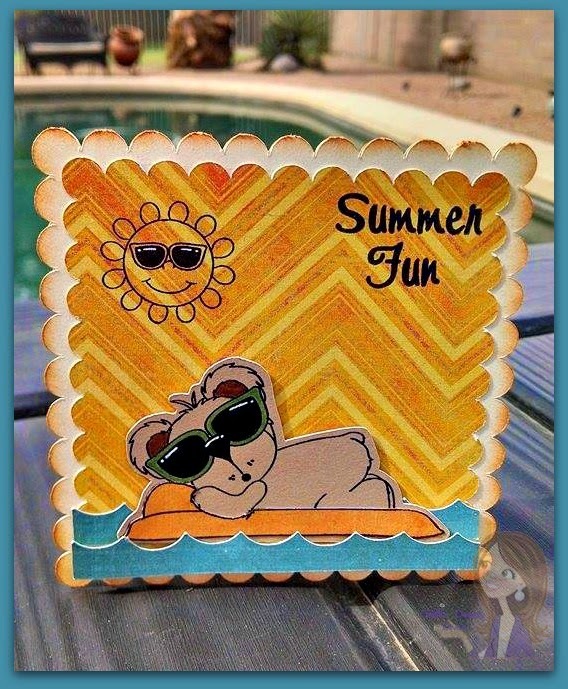 ( All my stamps that have images will come with FREE SVG cut) I did a little coloring with my Wink of Stella pens in the ears and around the sunglasses. This is the first time I have paper pieced on a stamped image and I have to say it was pretty simple. I paper pieced the little float the bear is laying on. 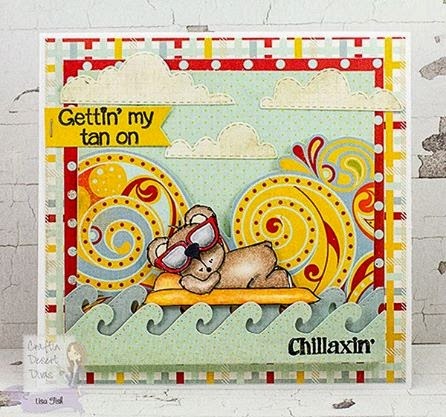 The sun and the sentiment are From this new stamp set! I hope you love these bears as much as I do. All You have to do is leave a comment on each of our blogs! You are NOT required to comment on EVERY SINGLE blog, but the more you comment on, the better chance You have for winning! Just click on the DT's blog page name to Their get to blog. Your teddy bear wearing sunglasses is just so cute Tara! Love it! Great DT cards! That is such a wonderful idea to include SVG files for your stamped shapes. Looks like some great things are in store for us. Great project. Your card is awesome. Love the background paper you used; it really make it warm and fun. Enjoyed the DT projects, they did a fabulous job. Oh you girls are fabulous!!! They all look amazing!!! 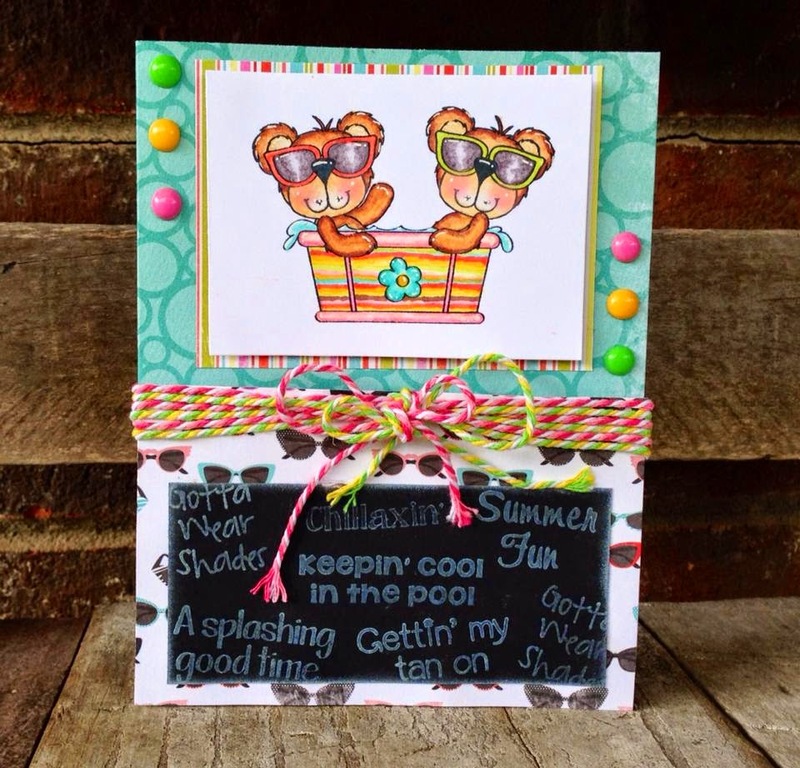 Like your mini card with wonderful coloring, scallop edge & fun bright sunny colors. Enjoyed all the sneak peeks for today. Adorable DT projects!!! Tara, love your little bear! Loved all the projects! You card is adorable and I am loving these stamps! OMGosh I guessed it. You are adding images to your terrific sentiments!!!! AND I LOVE that the first one is bears. I have collected bears since I was a child. Tara your card is ADORABLE. Thanks for sharing. Trina your images are sooo CUTE. Oh I am one happy camper. I did notice that you guessed it!! Great job. I'm so happy you are liking these bears. Can't wait to share the rest with you this week. I do not have a Facebook account so I can't leave Melissa a comment there. Please tell her I LOVE her WONDERFUL card. It it so cute. Thanks for sharing. Love blog hops so much! Loving all the cute cards! All awesome creations!!!!! Fab job by the DT! Tara another great job with awesome sneaks! Your card rocks! oh my!!!! These images are just adorable!!! I'm really going to have to get working on my coloring!!!!! Can't wait to try them out!! So excited for this release!! These are all just too cute!! Love the new stamps!! Great card, Tara! I really like your background paper. It makes it really look like the sun is shining! Wow...how cute are ALL these bears! Absolutely loving these...so stinken cute and they've all melted my heart:) So stinken cute Tara! Great job on your mini note card! Adorable design! Ohhhh I love these!! How did I not know about y'all?? Just found you a few mins ago on tara's fb...Love!!! :) I need! Stamp set is very nice.! 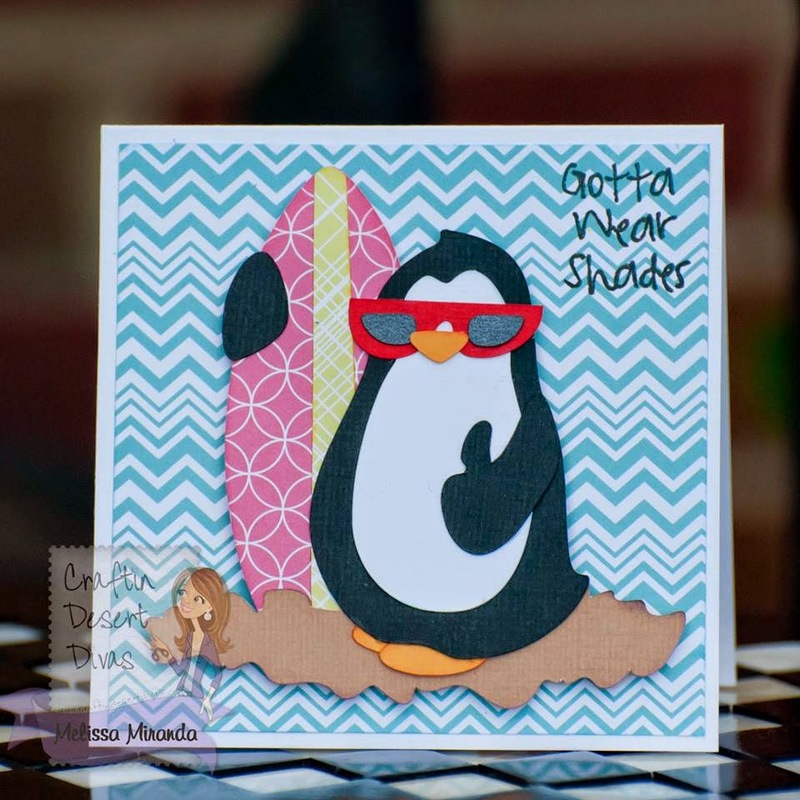 Super cute sneak peeks! Love the sweet little bears, awesome projects ladies, can't wait for tomorrow! Wow, and more Wow!! 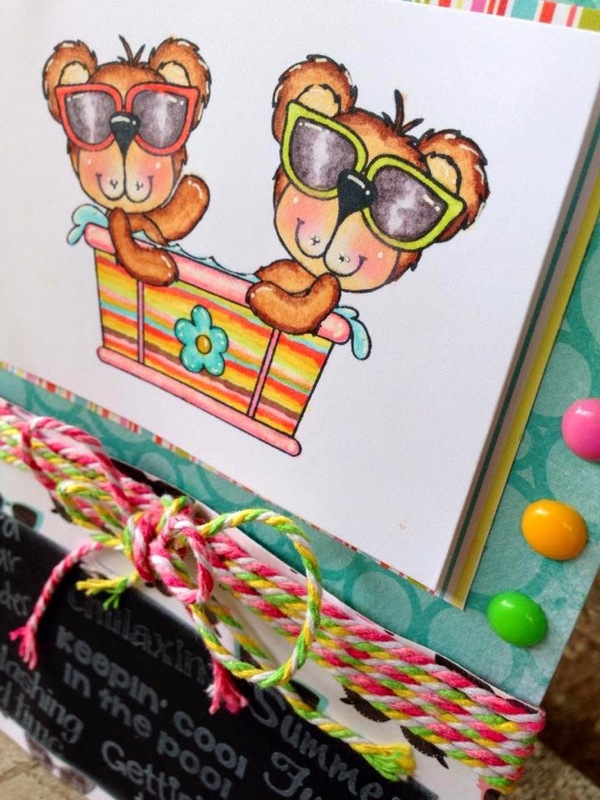 Love the little bears, looks like an awesome stamp set!